Medicare accounts for about 29 percent of all spending on prescription medicines in the U.S. each year. Drug companies could be forgiven if they're confused about whether President Trump thinks the government should get involved in negotiating the price of prescription drugs for Medicare patients. Just a few days before Trump was sworn in, he said the pharmaceutical industry was "getting away with murder" in the way it prices medicine, and he promised to take the industry on. It was a promise he'd made repeatedly on the campaign trail. "We're the largest buyer of drugs in the world and yet we don't bid properly," he said at a news conference in early January. "We're going to start bidding and we're going to save billions of dollars over a period of time." But last week, Trump appeared to walk that vow back when he met with the leaders of several giant pharmaceutical companies at the White House. "I'll oppose anything that makes it harder for smaller, younger companies to take the risk of bringing a product to a vibrantly competitive market," he said, sitting around a table in the Roosevelt Room, flanked by leaders of five large drugmakers. "That includes price fixing by the biggest dog in the market — Medicare — which is what's happening." So on Tuesday, White House spokesman Sean Spicer cleared up the confusion, for now at least. When asked during his daily news briefing whether the president is in favor of having Medicare negotiate lower prices for prescription medicine, Spicer said: "He's for it, yes. Absolutely." Spicer went on to say that the U.S. should be doing what other countries do — bring the government's purchasing power to bear to get a better deal on medicine prices. "So his commitment is to make sure that he does what he can," Spicer said, "and, I think rather successfully, use his skills as a businessman to drive them down." 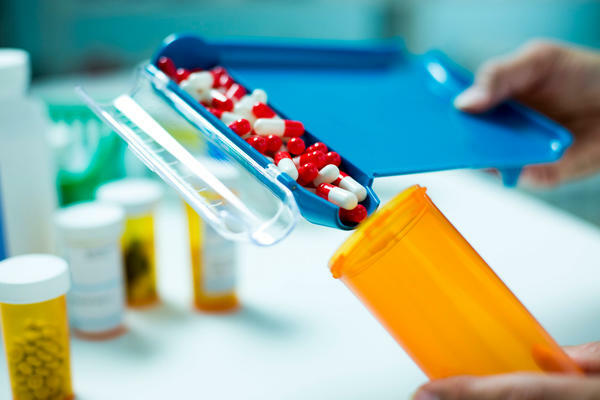 Current U.S. law prohibits Medicare officials from interfering in the negotiations between drugmakers and the insurance companies that administer Medicare's prescription drug plans. Medicare accounts for about 29 percent of all spending on prescription medicines in the U.S. each year. So, would bringing Medicare's huge purchasing power to bear in talks over prescription drug prices actually reduce those prices? The only government report that looks at the issue is a 2007 Congressional Budget Office study that concluded that it would have a "negligible effect" on prices. Dr. Walid Gellad, director of the Center for Pharmaceutical Policy and Prescribing at the University of Pittsburgh, disagrees. "There's a reason why the pharmaceutical industry does not want Medicare negotiation to happen," Gellad told NPR. "And the obvious reason is because it will lower prices." Gellad said the CBO report doesn't take into account the ability the government would have to say no to some particularly high-priced medicines. If Medicare, for example, said it would pay for only one of the two major hepatitis C medications on the market today — drugs that cost upwards of $40,000 for a course of treatment — Gellad estimates the drugmakers would cut the price by at least $10,000 to win the government's business. That sort of negotiating is already allowed at the U.S. Department of Veterans Affairs. "If Medicare were to get the same prices for drugs as in the VA you'd have billions, tens of billions of dollars of savings," Gellad told NPR. The Medicare prescription drug program was created in 2003; the program's drug coverage is handled exclusively by private insurance companies. There is no direct government pharmacy coverage. That means each insurer negotiates prices for medications separately. If one insurance company strikes a deal regarding one drug, another company may negotiate a better price for a competing medication. A 2015 study jointly published by Carleton University and the public advocacy group Public Citizen showed that Medicare pays, on average, 73 percent more than Medicaid pays for brand-name drugs, and 80 percent more than the VA pays. Let's examine now the contradictory statements the president has made about drug prices. He has said he wants the U.S. government to negotiate lower drug prices for Medicare, but he's made other statements that seem opposite to that. Here's NPR's Alison Kodjak. ALISON KODJAK, BYLINE: Drug makers could be forgiven if they're confused about whether the president thinks the government should get involved in price negotiations. Just a few days before he was sworn in, he made this promise. PRESIDENT DONALD TRUMP: We're the largest buyer of drugs in the world and yet we don't bid properly. And we're going to start bidding. And we're going to save billions of dollars over a period of time. KODJAK: But last week, he seemed to walk that back when he met with the leaders of several giant pharmaceutical companies. TRUMP: I'll oppose anything that makes it harder for smaller, younger companies to take the risk of bringing their product to a vibrantly competitive market. That includes price fixing by the biggest dog in the market, Medicare, which is what's happening. KODJAK: So yesterday, his spokesman, Sean Spicer, cleared up the confusion, for now at least. He was asked whether the president was for Medicare negotiating lower prices. UNIDENTIFIED WOMAN: He's still for it. KODJAK: And he went on to say that the U.S. should be doing what other countries do, bring the government's purchasing power to bear to get a better deal. SPICER: So his commitment is to make sure that he does what he can and, I think, rather successfully uses his skills as a businessman to drive them down. KODJAK: But will that actually save money? WALID GELLAD: There's a reason why the pharmaceutical industry does not want Medicare negotiation to happen and the obvious reason is because it will lower prices. KODJAK: That's Walid Gellad, who studies drug pricing and policy at the University of Pittsburgh. He says the key to Trump's plan is for Congress to allow Medicare as a whole to negotiate a good price or walk away. That's already allowed at the Department of Veterans Affairs. GELLAD: If Medicare were to get the same prices for drugs as in the VA, you'd have billions - tens of billions in dollars of savings. KODJAK: Today, insurers that handle Medicare prescription coverage negotiate separately thanks to a law passed by Congress in 2003. Alison Kodjak, NPR News, Washington. Transcript provided by NPR, Copyright NPR.